In this game White has an extra passed pawn, whilst Black has two doubled pawns and an isolated pawn. My plan will simply be to fix the pawn on the kingside, use the threat of promoting the a-pawn to restrict his rook to defending against that pawn and then when things are fixed on the kingside bring my king across to release my rook to either gobble up the pawns or win his rook on the queenside. 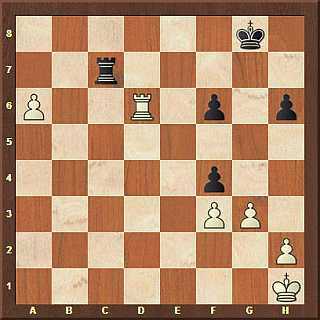 63…Ra8 64.a7 Kf7 65.Ra6 Kg7 66.Kg4 Kf7 67.Kf4 Ke7 68.Ke4 Kd7 69.Kd5 Kc7 70.Rxf6 Rd8+ (70…Rxa7 71.Rf7+) 71.Ke6 Re8+72.Kf7 and White will move to Kg7 followed by Rf8 and Black cannot stop all the holes. b) 53.Rxf6 Rc1+ 54.Kg2 gxh2 55.Kxh2 (55.Rxh6 Kg7 56.Rxh2 Ra1 is draw) Kg7 56.Rb6 (56.a7 Ra1 is draw) Rc4 and black's plan is to put the R in a4 and the king on g7-h7 waiting the f pawn. Da Schwarz einen anderen Zug 52. ... fxg3 angibt ist die Analyse von Weiß hinfällig. a) würde klappen und wäre dann ein Remis. Schwarz bleibt mit dem Turm auf der 7er Linie und der König auf Kg6. Ein endloses Spiel, also Remis. b) auch hier, die Analyse ist korrekt und wir hätten ein endloses Spiel, also Remis. Because Black another move 52. ... fxg3 indicates the analysis of white void. a) would work and would be a draw. Black remains with the rook on the 7 line and the king on Kg6. An endless game, so draw. b) Also here, the analysis is correct and we had an endless game, so draw.